One thing is for sure on social media, engagement is the key to both growing your audience and getting attention. And on Instagram, engagement comes in the way of likes, comments and follows. But to get those likes, comments and follows from people we want to attract, first we need to get our ideal customers seeing our posts. The difference between not using hashtags and using them, is the difference between a few people seeing your Instagram posts and thousands or more seeing your photos. Quite simply, hashtags are a way to categorise posts and find others that are similar. If for example you post a photo with the hashtag #breakfast, you are categorising your photo as something to do with breakfast. Click on that hashtag and you'll find other posts with the same theme. Whether it's pancakes, you sitting at a table during breakfast with a view behind you (with or without food showing), a cup of coffee next to your laptop, or a recipe being shared, they all have the breakfast theme in common. It's a quick and easy way to identify yourself and your photos on Instagram. As many as you are allowed! Instagram allows for 30 hashtags. I suggest using all 30 to increase your chances of being found on Instagram. “Ummm, no way. I can't type that many every time” you say. No problem, there's always a work around. If you want to get started for free and store your commonly used hashtags for copy/pasting then type all your hashtags into ‘notes' on your phone. Or if you want to get fancy and make the job quicker, I use an app called Plann which allows you to store, categorize and easily copy/paste your hashtags (amongst other great features). Either way, the more hashtags you use, the more ways you can categorize your photo, who you are, what you do, and attract the audience you want to view your photos. Which hashtags should I use on Instagram? That's the million dollar question! Which hashtags you choose though can be the difference between standing in the middle of the street talking to every random person you see walk by, or being in a conference room filled with people interested in your sorts of products or services. Choose your hashtags thoughtfully, and you'll get your photos and your Instagram profile in front of the people you want to be seen by. A word of advice: When you choose very broad hashtags that are hugely popular, like #travel (which currently has over 138 million hits), #love, #instagood and so on, you also attract a LOT comments. Which seems like a good thing, but you'll find most of them will be smilie faces or comments such as “awesome!” or “so cute!”. These are automatic comments made by software that some Instagrammers use and do nothing for you, or for them (but that's a whole other blog post!). The other issue with using hugely popular hashtags is that your photos will get lost in the crowd since it's such a busy category. How do I get Authentic Likes & Comments? You can balance things out by drilling down a bit and niching on your hashtags. For example: Let's say you're posting a photo of London and you want to use the hashtag #london. Try niching down to the topic that your photo is really about. For example: #londonlife #londonfood #londonfashion have a fraction of hits compared to #london (although still a decent number). You'll also attract a more engaged audience that is interested in your photo and your offering by using niched hashtags. So by all means use a couple of larger hashtags, but to really be seen you want to use hashtags that aren't bombarded by everyone out there. Using smaller hashtags (under 1 million hits, preferably around 500,000 or less) will keep you at the top of that specific category longer and you'll be more visible to people searching that hashtag. Just go into Instagram and click on the little magnifying glass at the bottom of your screen which brings you to the search page. Tap on “Tags” then start typing your usual hashtag. Instagram will then give you a whole list of similar hashtags you can use. It even tells you how many posts are out there with that hashtag. Just scroll down the list of suggestions to see some new ones that you may not have thought of. I'm not a huge fan of this one because I'd rather pave my own way and find different hashtags. But, many people do like this tip and it's a good place to start if you're brand new to using hashtags. Just take a look at the hashtags others who have similar accounts to you are using. This will give you an idea of a broader range of hashtags and you might find some there that you never thought of. If you are looking for more exposure (pardon the pun!) and you have great photos, then consider using hashtags started by other Instagram accounts who are known to feature photos from around Instagram. These Instagram accounts have huge followings, so getting on their radar, and your photo featured will get you in front of way more people than you could on your own. Here's a few examples of some accounts that will repost your photos. If you take a look at these accounts, it'll give you a good idea of how others get featured on large Instagram accounts. Want to get featured by your favorite brand? Find the brand's Instagram account then check to see if they have their hashtag in their bio. For example, on Kikki K's Instagram account they use the hashtag #kikkiKLove. Use their hashtag whenever you feature one of their products in your photos for a chance of getting featured. Try checking out your favorite brands on Instagram to see which ones have their hashtag in their bio. If you're in fashion and feature other people's clothes, then this is a great option for you. Where's the best place to put my hashtags? You've probably seen that people will often put their hashtags in the first comment. The reason you want to do this is so you're not cluttering up your caption and making it look spammy. Just make sure that you have your hashtags copied and ready to paste as soon as you hit ‘share'. This is because once the photo is up, that's when Instagram gets to work and the hashtags take effect. Once upon a time you were able go in and use some extra hashtags in a comment later on to bump up your photo, but that feature has gone now. This is another reason to make sure that you have your hashtags organized and ready to pate before you hit the ‘share' button on your photo. What is the “* * * *” thing I sometimes see before hashtags? That's a little trick Instagrammers use to hide their hashtags so they don't make their post look messy. To do this, use your ‘notes' app on your phone to type in asterisks, spaced lines, and hashtags, then copy/paste into Instagram. Personally I don't bother with it because I know I'll get a comment fairly quickly, so my comment gets pushed up so the hashtags don't show. So that's your guide to using hashtags on Instagram for more likes and comments. Now if you really want to ramp up your business with social media and turn your followers into warm leads, then let's talk. I'd love to take a look at your social media and hear what your vision is for your business. Book your free Social Media Breakthrough call with me here. Nice suggestions. The hashtag is a great way to see organic growth! I never knew the trick about hiding hashtags! Going to give it a try! Thanks Pam! Glad you found a useful tip too. Thanks for your comment! Thank you for this! 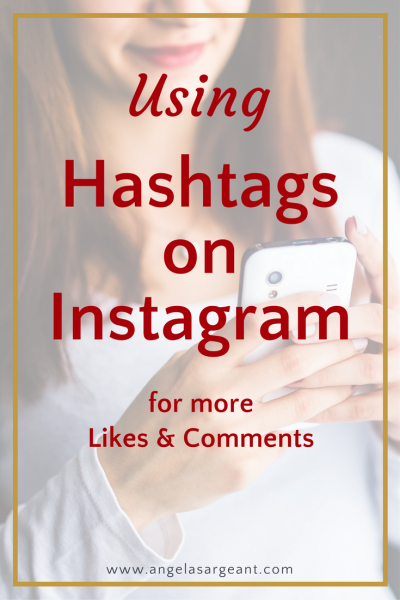 Hashtags can be so confusing, I’m just starting to learn how to use them, and this blog will help. I’ve recently started keeping hashtags in my Notes to copy and paste and find it extremely helpful. And I’ve always wondered about those generic comments and their purpose! Hi Jennifer, thanks for your comment. So happy my blog post was helpful. Yep, those generic comments are annoying ‘bots’. Great that you’re using your notes to copy/paste hashtags, it also helps avoid making spelling mistakes when you have them pre-done. Hi Angela, I always enjoy your tips. Does the hiding of hashtags work on other platforms as well? Hi Melanie, thanks for your comment and question. If you mean Facebook, I don’t use hashtags on there as Facebookers don’t tend to use them like Instagrammers do. Having said that, there’s always exceptions. One of them is if your audience are particularly social media savvy then go for it. Or if you’re hosting an event (live or online) or attending one, or publicising a movement, then using a hashtag is a great idea to connect with others and be found. For Twitter, no need to hide, use them as you like! I love how you give such great tips, examples and make instagram, a platform I have yet to explore…understandable. I love the tip of pre-made hashtags! Thanks Jul’s! If you ever want to get onto Instagram then give me a yell. Very happy to help you in any way I can. wow. very helpful, angela. i am s-l-o-w-l-y navigating my way through instagram. (my sons just told me about the 30-hashtag-limit when they were here for christmas! 🙂 i had no idea.) everyone i know uses and loves it, but for some reason it’s a social media site that i don’t find intuitively attractive. i want to like it, but i’m still a bit intimidated. your tips have been invaluable. So happy it was helpful for you April! Goodness though, Instagram is perfect for you with your gorgeous photos and beautiful words. Happy to get you started whenever you’re ready. Angela, I’m not on Instagram (yet), but thanks to your post, I may find myself there sooner rather than later. I totally get what you’re saying and am excited to give all your tips a try. I think I’m just stuck on what images I would use for my posts as I’m service based as opposed to product based. I’d love any ideas (or future blog posts) you may have on the topic! Thanks for another super-informative post!! Wow Angela I love this blog post! So informative. I have been using hashtags on my Instagram but this makes it crystal clear which ones and how I should be using them. I will have to check out the Plann app. You always have such on target social media tips! Thanks so much Beth! So happy that my blog post was useful for you. And good luck with your Instagram. Thank you! Love this blog post: very informative, I learnt a lot and I will apply your tips as suggested. Thanks for your comment Marta. I’m so happy to hear you found it useful. Now I see you copy and paste. Every time I tried to do it, it would post when I hit return after the asterisk. Duh! Yep! Would be easier if that feature was already there in Instagram Beth, but having that ready with your hashtags to copy/paste is the way to go.